When winter cold brings snowy or icy conditions all outdoor work, even walking, can become treacherous. Workers need serious traction to prevent dangerous and costly injuries. Falls each year cause numerous injuries. Most frequently these injuries are to the head, wrist, elbow or hip. With a little planning, caution, and proper footwear, you can remain upright during our sometimes treacherous winter conditions. 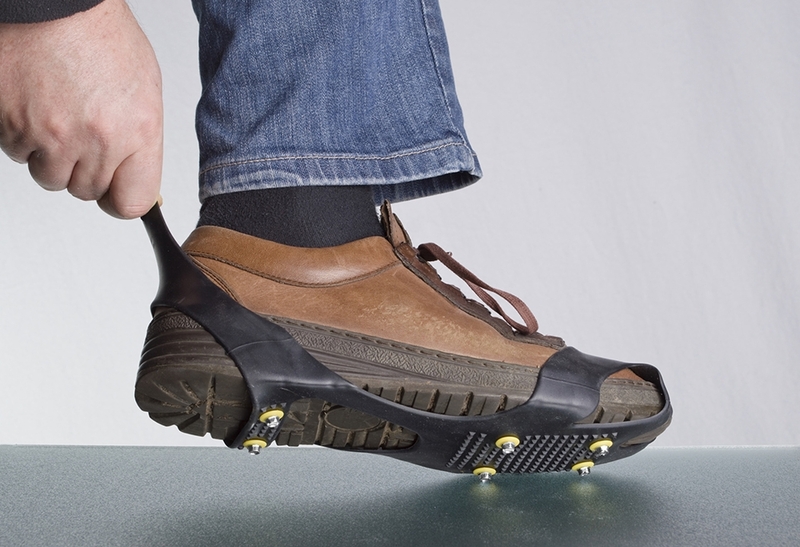 Ice cleats slip over existing footwear and are very effective at helping prevent falls on ice and snow and can be purchased at your local safety supply store or even at some local drug stores. Following are some tips on keeping your buildings and job sites safer. Wear footwear with heavy treads for increased traction. Make yourself visible to drivers by wearing brightly colored jackets or clothes. Consider wearing sunglasses to enable you to see through the bright snow reflection. Keep your hands out ready to steady yourself in case of slips. Use three point contact when walking down stairs ways. Look ahead where you’re going and anticipate obstacles like uneven ground and ice or puddles. Avoid carrying heavy loads that may tip your balance. Test slippery areas by tapping a foot before walking. Walk slowly and in small shuffling steps to prevent slipping. Clear off the heavy snow with a shovel. For best results, use a specialized snow shovel. Sweep off the leftover snow. Apply eco-friendly chemical de-icer to keep the ice from forming longer. We hope these tips will help keep everyone a bit more safe this winter season.